Référence bibliographique : Nineteenth-Century French Studies, vol. 47, n° 1-2, en ligne, 2018 : http://www.ncfs-journal.org/?q=current-toc. 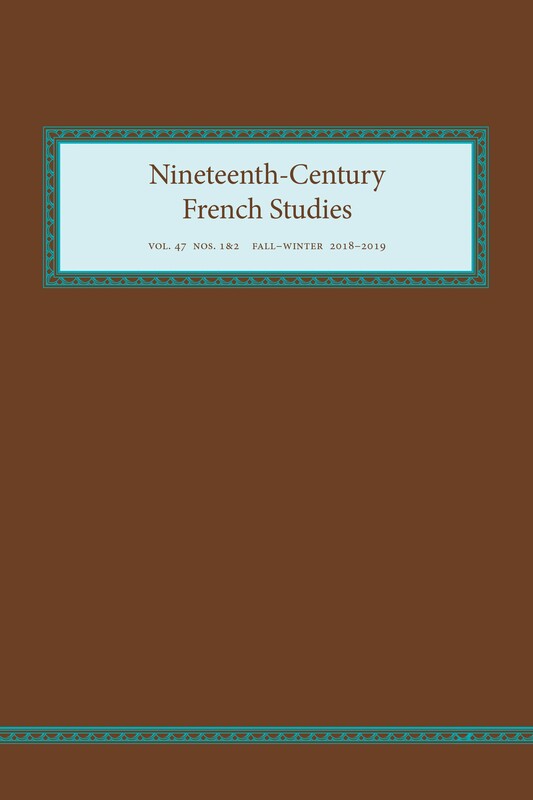 The Editorial Board of Nineteenth-Century French Studies is pleased to announce the publication of volume 47 numbers 1–2 (Fall–Winter 2018–19). In addition to a dialogue between Corry Cropper and Graham Harman about object-oriented ontology (OOO) and the Fantastic, the issue includes a range of articles and reviews that highlight the breadth of the discipline: from archives, infatuation, political engagement and blank spaces to religion, imperialism, blindness, translation, and misfits. As such, it continues the journal’s longstanding tradition of covering the full range of studies of nineteenth-century French literature and related fields.